Please excuse my Christmas wrapping paper! 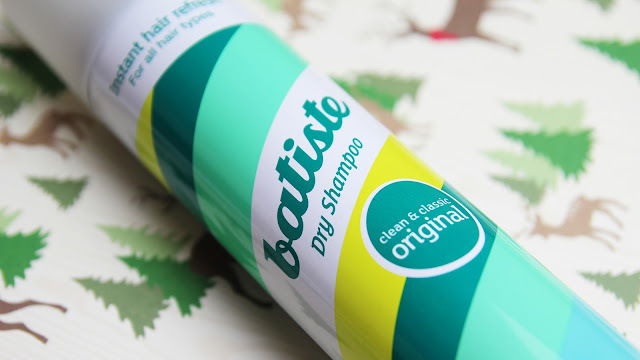 Today I am just coming at you guys with a quick little review of one of my newest obsessions: Batiste Dry Shampoo. Not only do I love the clean and classic scent, but I have also been dying over the brunette tinted version. This is hands down the best dry shampoo I have ever tried to date. It is easy to use, smells great, and leaves your hair feeling fresh and clean. For me I tend to use dry shampoos on second day hair. I don't have too much of a problem with oil, but just enough for this to really be a quick fix that works almost as well as showering, without the hassle. Another time I use this is if I come home from work and don't have time to wash and dry my hair before going out. I will take a body shower and then just douse my hair with my Batiste and I am good to go! Have you tried this dry shampoo? What is your favorite scent? Available from ulta.com for $7.99 for 5.05 fl. oz. of product. I haven't tried this brand but have been trying other brands out. Thanks for the input! I will have to keep my eye out for these! A lot of people I know use this dry shampoo, I've tried it for myself but it doesn't do much on me personally! I don't use it to 'reduce oil' as such, more for that extra volume!